The World Cup will take a two-day break before returning to action on Wednesday when it'll be those giant killers Japan hogging the limelight again as they take on Scotland in Pool B at 14:30 BST. They couldn't do it again could they? Australia will take on Fiji, while France battle Romania in the other matches. It's a day which promises much and, so far, this tournament has delivered. There will be more live coverage from us on Wednesday so do join us then. In the meantime, why not read Ben Dirs' take on New Zealand being "shaken to the core". Thanks, as always, for joining us. Bye for now. The 2015 edition of the Rugby World Cup is under way and what an opening weekend it has been. Japan would never beat South Africa, they said. But as Ben Dirs writes, reflecting on the biggest upset in Rugby World Cup history: "It actually happened. I checked. Oh to be a fly on the wall in that South African dressing room. Forget the game itself, that fly had the hottest ticket in Brighton." To read more on Ben's take on Japan's miracle in Brighton click here. It's worth five minutes of your time. As has already been mentioned, Wales' rugby followers will be hoping the team's medical staff have healing hands but even that might not be enough for centre Cory Allen who is set to miss the rest of the World Cup after injuring his hamstring in the opening 54-9 win against Uruguay. The good news is that full-back Liam Williams' thigh injury is not thought to be serious. New Zealand will be satisfied with their victory but Wales have a worrying few days ahead of them after further injuries to the squad during their victory over Uruguay earlier this afternoon. Argentina were forced to make a lot more tackles in that second half, a reversal from the first 40 minutes. The big stat is the 33 tackles the Pumas missed, which is something you can't afford to do against the World Champions. Here are the attacking stats from the match and New Zealand lead the way in every aspect of the game. New Zealand captain Richie McCaw speaking to ITV Sport: "I guess that's what you expect first up. I thought that second half was a lot more clinical. It's a magic place to play here at Wembley, it's one of the great grounds to play at. "It's been a while since our last game and we've been over here for 10 days or so, so we were itching to get out there and get started. We'll have to make a few improvements but that's the nature of rugby." It's a rare sight seeing Richie McCaw trudge to the sidelines after being shown a yellow card. It was the third time the captain has been sin binned in an All Black shirt. And here's the killer stat: no All Black has been yellow carded more than McCaw, with the captain now level with Kees Meeuws, Sam Whitelock and Tony Woodcock. Sonny Bill Williams had a stormer at Wembley after coming on at half-time. After just 40 minutes he has jumped to the top of the offloads table, alongside Georgia's Mamuka Gorgodze. New Zealand face Georgia in Pool C on 2 October. "New Zealand will be very relieved and very sore tonight. They'll be straight into the ice baths. The Argentines did very well. It was only right at the end that the All Blacks could start enjoying the occasion. "The Argentines need to refocus now, because the other three teams in their pool will be targeting them. Tonga, Georgia and Namibia would all see it as a feather in their cap to beat Argentina." A superb performance by Argentina but they didn't quite have enough. New Zealand's replacements were influential in the second half, with Sonny Bill Williams having a significant impact. "A big factor for the All Blacks when they face Namibia in the next game on Thursday is that it is only four days after this match, which has been a real physical battle, so I would expect a lot of changes. There's no way you can get through a World Cup with your top 15 men playing 80 minutes in every game, so they need to share the workload." It's all over, folks New Zealand not at their free-flowing best but they weren't allowed to be with Argentina's defence well-organised and alert. The All Blacks not moving away from the tackle which presents the Pumas with a rare chance to visit the New Zealand half. It's been quite some time since they were last in that half of the pitch. So long, in fact that they've forgotten what to do and although they retain possession they're moving backwards. "It shows how tough this game has been that every time New Zealand get a sniff, they've been very anxious to make it count. As a result, sometimes their passing hasn't been as clinical as they would have liked, because they've been so anxious." Not wanting to repeat myself, but this graphic shows how New Zealand have dominated territory and possession with much of the play in the Argentine 22. The All Blacks enjoying 61% of the possession and had it not been for rare mishandlings they would have scored a couple more tries in these closing stages. From a scrum, New Zealand's backline are squeezed by Argentina's drift defence. The Pumas certainly have grit for guts. "We all need a breather at the moment. There''s been plenty of willingness and enterprise from both teams - maybe a few too many mistakes too. Argentina just haven't stopped going all day, and their defence has been outstanding. New Zealand will know they've been in a heck of a game." Aerial exchanges between the sides before Sonny Bill Williams finds touch, giving everyone a respite. Conrad Smith playing scrum-half and he nearly burst through Argentina's defensive line. The All Blacks going through the phases, sucking in Pumas and putting them out of play. But the South Americans are refusing to surrender and sniff the ball out from the breakdown. Impressive defending. Dan Carter, New Zealand's dead-eye kicker, kicks over the Argentine defence for Conrad Smith but Santiago Cordero soars higher and that's brilliant defending in the shadow of the posts from the Pumas winger. "People might expect normal service to be resumed now, but this has been a very tough encounter. It's not over yet. Ten points is a tough ask for Argentina, but they're not out of it yet." Under 10 minutes remaining and it feels as if New Zealand could score at least one more try in that time. The Argentines breathing heavily. New Zealand with a line-out behind enemy lines and from quick ball they form a maul and go rumbling forward. "That was real simplicity but great execution from New Zealand. They've finally been able to string seven or eight passes together without being hit by an Argentine missile. The All Blacks will breathe a huge sigh of relief now. Sonny Bill Williams has made a huge difference since coming on." It's a question of who will score. The All Blacks move the ball along the backline, they have men in numbers... from Sonny Bill Williams to Sam Cane and Richie McCaw's anointed successor jogs over the line and has time to touchdown behind the posts. Simple two points for Dan Carter. "Sam Cane coming on means that Richie McCaw will move to the blind side. This could be Cane's time to shine." The Wembley crowd roaring, enjoying the spectacle as we enter the final 15 minutes. New Zealand on course for another try. Aaron Smith sniping and snapping, supporting Sonny Bill Williams who punctures holes in midfield. Sam Cane simply needs to collect the pass and stroll over - but he messes up 2m out. "One of the great things about Argentina today has been their positive attitude. They are usually a team, and I don't mean this disrespectfully, who like to shut the game down against the major sides, but today there's been none of that. They've rolled the dice, and it's worked for them. They've made it difficult for New Zealand." New Zealand are turning the screw here and deserve their try. The graphic below shows how much time they are spending in the Argentina 22. Suddenly the Pumas are the ones doing the majority of defending with 90 tackles to 71, while the All Blacks have edged ahead in metres covered - 321m to 249m. Sonny Bill Williams has had an instant impact. We know he loves a one-handed off-load and he's already produced three offloads, the highest in the game, including the one to Milner-Skudder who should have scored earlier. Tomas Cubelli does well to grab the high, bouncing ball with Conrad Smith breathing over his shoulder. Was it a late tackle from the All Black centre? Possibly, but nothing comes of it. "Good work by Aaron Smith, who showed his speed of decision making. New Zealand tried to shift the ball quickly from the point of win at the lineout because this beef of Argentina doesn't go backwards. This a crucial period of the game now." Something for the All Black fans to cheer. Eventually their persistence pays off. Scrum-half Aaron Smith collects the ball from the base of a breakdown, a shuffle of the hips and the diminutive number nine dives over, giving his half-back partner Dan Carter a simple conversion. Argentina needing to hold firm in face of a wave of All Black attacks. Steve Hansen's men have the tryline in their sight... 5m short when they decide to give the backline the chance to break the Pumas defence. Wayne Barnes spots a high tackle by Dane Coles - but comes back for an initial Argentine offence at the breakdown 5m from their own line. Chelsea boss Jose Mourinhois in the crowd at Wembley. Asked earlier in the week about his plans he replied: "I go to New Zealand against Argentina [in the Rugby World Cup] because I love it." The cameras find Chelsea manager Jose Mourinho watching on from one of the VIP seats. The Blues manager knows one or two things about shock results this season. Argentina defending, defending and defending some more. New Zealand attempting to rock the Pumas with their power - but these South Americans are tough beasts. "Steve Hansen wants to inject fresh energy into the scrum, so he's changed both of his props. They're both mobile props as well." Quote Message: If Argentina manage to pull this off, the impact of their fans should not be underestimated. It's a proper football atmosphere in here, but barely a peep out of the Kiwis, other than when they're mounting a rare assault on the Pumas line. If Argentina manage to pull this off, the impact of their fans should not be underestimated. It's a proper football atmosphere in here, but barely a peep out of the Kiwis, other than when they're mounting a rare assault on the Pumas line. "If Argentina manage to pull this off, the impact of their fans should not be underestimated. It's a proper football atmosphere in here, but barely a peep out of the Kiwis, other than when they're mounting a rare assault on the Pumas line." Argentina's fans have turned a patch of Wembley into Buenos Aires, they're on their feet, waving their flags, chanting and singing, hoping to give their men extra strength. There's a slight stop in play as there's a host of substitutions. Beauden Barrett one of the new faces, coming on to replace Nehe Milner-Skudder. "We saw the effect of the bench for England on Friday with Burgess and Vunipola. New Zealand's coaching team have obviously decided they want the same effect from Sonny Bill Williams and Wyatt Crockett. I think Nehe Milner-Skudder just clutched at the ball there when he had the tryline in sight. But Sonny Bill Williams is involved immediately." We're back to 15 against 15 as Conrad Smith serves his sentence and returns to the battlefield. Argentina need to hold firm on their own scrum as they defend their tryline, and they do just that. New Zealand turning illegally, gifting the Pumas a pressure-relieving touch-finder. Yes it will! Sonny Bill Williams with a flick from the back of his hand as he absorbs a bone-crunching tackle but Nehe Milner-Skudder handles the ball as if it's covered with nails and that's a try-scoring opportunity missed. Conrad Smith screams despairingly on the sidelines. A significant change to the All Black backline as Sonny Bill Williams replaces Ma'a Nonu. Will the multi-talented Williams' off-loading in the tackle add another dimension to the All Black play? Argentina edge the attacking stats with more metres covered (Arg 228 NZ 181) and most importantly the game's only try. The world champions have also been forced to make more tackles (Arg 51 NZ 61). More yardage to that Argentine stat as Juan Imhoff chases a kick ahead...The crowd whopping and hollering... Ben Smith is the last defender but he does his job tidily. New Zealand have kept the scoreboard ticking over thanks to the amount of penalties Argentina have conceded shown by the black circles, not ideal when your opponents have Dan Carter. The world record points scorer has ensured he has punished the Puma's ill discipline with four kicks from four. The All Blacks have conceded half as many, show by the white circles, but two of those resulted in Richie McCaw and Conrad Smith sent to the sin bin. "If any team can keep the passion going, it's Argentina. They are one of the two seeded team in this pool, so they deserve respect - and New Zealand have shown respect with the strength of the side they've picked." Argentina still have a man advantage after Conrad Smith's sin-binning so they must take advantage of that and they're trying to. Nicholas Sanchez with a cute chip over the defence, and there's an All Blacks offside - so the outside-half will have a shot in front of the posts. Argentina, the would-be All Black slayers receive a raucous reception as they return to the field. Thirty men on the pitch? One referee? Yep. Let's get going. "New Zealand haven't played at their best. They've probably conceded a few too many turnovers at the breakdown by getting isolated. There's plenty to work on. "I think Argentina will be very encouraged by their first-half performance. They have given the ball away a little too much, and they need to tighten up on that or they will tire and start shipping points in the last 20 minutes." New Zealand edged possession in the first half but that will be of scant consolation to them after a half where they let a nine-point lead slip and had two players sent to the sin bin. That is not the scoreline which many of us would have predicted, especially after New Zealand attacked at breakneck speed in the first 10 minutes. But Argentina's defence held firm and they showed plenty of endeavour during that half, too. "That was silly from the Pumas. The All Blacks were looking to wind down the clock and maybe get a penalty. They were never going to score a try with 13 men. Argentina have played right into their hands. New Zealand can go into the changing room with a little positivity." A few whistles can be heard as Dan Carter lines up to take his penalty. Argentina concede a penalty at the death and the All Blacks reduce deficit to a point. "Fantastic play from Argentina working their play from side to side and making progress up the field. Conrad Smith will argue that the ball was out and he was going for the ball. But the All Blacks are really scrambling." Will the Pumas opt for the posts? Yes they will and Nicolas Sanchez cannot miss from there. Another three points and they open up a four-point lead. New Zealand reduced to 13 men. Juan Imhoff breaking loose once more but he's stopped agonisingly close to the posts.. Conrad Smith supporting the tackler but is off his feet at the ruck. The All Blacks puncturing holes in the Argentine defence,.. New Zealand threatening... Conrad Smith and Ma'a Nonu looking menacing... the men in black ease to withing 5m from the Argentine line but the Argentine defence is as tough as teak. Kieran Read loses the ball in the tackle and the Pumas can breathe again. Argentina oozing confidence and they attempt to take it to the All Blacks from their own half... they've got the overlap but Nicolas Sanchez spills the ball and that is that. "Argentina have got past their jitters and they're giving it everything. They've got the crowd right behind them too." "Richie McCaw has had run-ins with Wayne Barnes in the past. I think McCaw was trying to do one of those cynical things that flankers do. I'm not making excuses for him, but he's not the only flanker who does that sort of thing." Nicolas Sanchez charged with sticking the knife in and that's what the orange-booted outside-half does. A super effort from just inside the All Black half. There couldn't be another World Cup upset, could there? The crowd hiss as Richie McCaw receives a yellow card for tripping Juan Martin Fernandez Lobbe as the back-rower attempted to take a quick free-kick. The All Blacks down to 14 men and they could soon be behind, too. With Pablo Matera in the bin and Argentina down to 14 men, you would expect the Pumas to be on the back foot. But New Zealand are having to do most of the defensive work with the Pumas a man down, with 34 tackles to Argentina's 22, and the All Blacks have missed a further eight. The Pumas have also made more metres and carries during this spell. The man leading New Zealand's defensive efforts? Who else but captain Richie McCaw with seven tackles. Guido Petti has had to leave the filed with a head injury but he's made his mark on the match. His team currently having to defend without him. "One of the things Argentina weren't good at when they lost to New Zealand in Christchurch in the Rugby Championship earlier this year was manipulating space and putting each other into gaps. Already, we've seen an improvement in that." What a difference 10 minutes make, Argentina have grown into this game and have begun dominating possession, although New Zealand have still enjoyed the better of territory. "Argentina put pressure on New Zealand there, with phase after phase. Some good footwork put the All Black defence off. They had support, they had players running into gaps. They edged up the field, and then the big boys in and just had too much power. Well done Argentina." An eye-catching weaving run from Argentina winger Juan Imhoff puts his team on the front foot... captain Agustin Creevy adds his weight to the momentum... the Pumas go through the phases... the tryline is looming and it's Guido Petti who dives over! Nicolas Sanchez adds the two points. Toot! That's the sound of Wayne Barnes' whistle. The All Blacks rumbling forward with ease and the only way Argentina can stop them is to do so illegally. Dan Carter rattles off another penalty and the All Blacks comfortably ahead without hitting full stride. 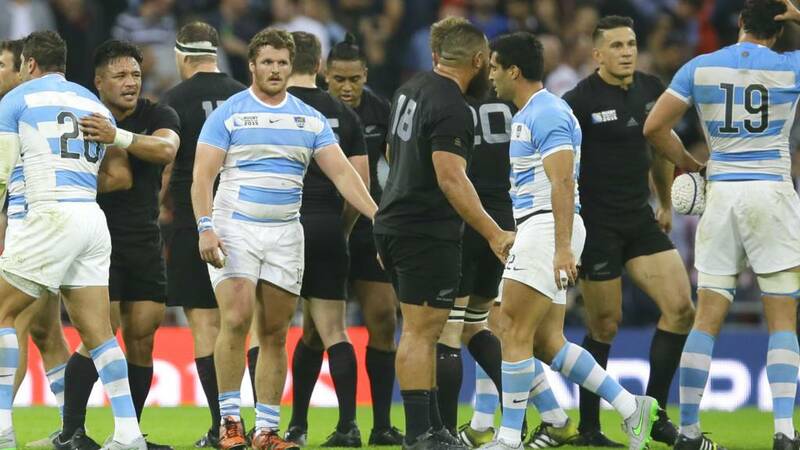 Argentina need iron discipline if they are to stun the All Blacks this evening, but Wayne Barnes is regularly finding fault with their play and every penalty simply gifts territory to the All Blacks. Referee Wayne Barnes' whistle blows, but this time it's for an All Black transgression - Richie McCaw straying offside at the breakdown. Wembley picture-perfect... they sky unthreatening and the seats jam-packed. All Blacks are playing the game exactly where they want to be, camped in Argentina's 22. The Pumas enjoying their best period of possession in the last couple of minutes, however, stemming the All Black tide momentarily by recycling without threatening. "Argentina weren't even back three yards there, let alone the 10, and the yellow card was logical. It was a little bit silly from the Argentines. It's one of those things that if it's not punished now, you can get fights later on. So Matera will get 10 minutes in the sin bin to gather his thoughts." Don't forget you can keep up to date with the action wherever you are by signing up for our rugby alerts. You'll probably get a number of alerts in the next 80 minutes or so. Argentina not as quick or as intuitive as the All Blacks in possession, but not many teams are. The All Blacks coming away with points once more after a visit into enemy territory. Dan Carter adding three points after Pablo Matera's yellow card. "Argentina may fancy themselves in the scrum. I don't think the All Blacks scrum is as robust as it has been in recent years." Honeyoed platform for Aaron Smith, who snipes down the blindside... All Blacks retaining possession... It's only a matter of time. Marcelo Bosch is told he didn't roll away from the tackle quick enough, which presents possession to the All Blacks. Lighting quick from the men in black, defence into attack at rapid speed - quick line-out, a kick ahead from Carter.. and the New Zealanders have a scrum 5m from the Argentine tryline. "New Zealand are well organised in defence. They've made a concerted decision not to give away any penalties. They're standing well back, and not giving Wayne Barnes any chance to give an offside against them." Argentina straying at the breakdown, which gives Dan Carter a chance to add to his 1,516 international points on a still London evening. The outside-half, one of the game's greats, rarely misses from in front of the posts and doesn't on this occasion. A reminder that you can listen to live radio commentary on BBC Radio 5 live sports extra by clicking the 'Live Coverage' tab. Argentina have an unenviable task before them this afternoon. Steve Hansen's side feature 1,013 Test caps in the starting line-up and a further 316 on the bench. They've won 20 and drawn one of their 21 Tests against Argentina and have over an 80% success rate in Test rugby during the last four years. What have you got, Juan Martin Fernandez Lobbe and co? Here we go then. A first chance to look at the defending champions, the overwhelming favourites. New Zealand, the most experienced XV in international history, have attracted a big crowd and Wayne Barnes and Dan Carter get the match under way. Quote Message: Not sure if it's team policy, but there are no fancy coloured boots for the All Blacks, which makes them seem even more menacing. The again, who's looking at an opponent's boots when he's stomping his feet in front of you and sticking his tongue out. Not sure if it's team policy, but there are no fancy coloured boots for the All Blacks, which makes them seem even more menacing. The again, who's looking at an opponent's boots when he's stomping his feet in front of you and sticking his tongue out. Ed's note - it's part of a boot deal they have with a sportswear manufacturer. There's four different types apparently - one of which is named the CrazyQuick Malice. Other ridiculously named boots are available. The Wembley turf a Granny Smith green, perfect for such a special occasion. This patch of land hasn't seen anything as ferocious as the Haka but is about to get a taste of the All Black war dance. The crowd revel in the theatre, as do we all. "I'll tell you what's on the players' minds as they emerge on to the pitch: 'Let's get through the next two or three minutes and get into the game.' You just want to get your hands on the ball, get your first shoulder in and get some physical contact. "The New Zealand players love doing the Haka because it's such an important part of the culture. But they just want to get started. They want to get through the anthems - and the Argentina anthem is pretty long by the way - and get to kick-off." "I wouldn't say Richie McCaw is vital, because New Zealand have created a lot of depth in the squad, but he's still an important player. "The strength of the squad is that nobody could be seen as vital now. I'd like to see Richie be able to concentrate on his strengths today, because the players around him are doing their jobs too." The noise inside Wembley sounds absolutely deafening. The two sets of players, New Zealand in their unmistakable black and Argentina in their familiar blue and white hoops, make their way past the World Cup trophy and onto the turf. New Zealand: Ben Smith; Nehe Milner-Skudder, Conrad Smith, Ma'a Nonu, Julian Savea; Dan Carter, Aaron Smith; Kieran Read, Richie McCaw (capt), Jerome Kaino; Sam Whitelock, Brodie Retallick; Owen Franks, Dane Coles, Tony Woodcock. Replacements: Keven Mealamu, Wyatt Crockett, Charlie Faumuina, Victor Vito, Sam Cane, TJ Perenara, Beauden Barrett, Sonny Bill Williams. Argentina: Joaquin Tuculet; Santiago Cordero, Marcelo Bosch, Juan Martin Hernandez, Juan Imhoff; Nicolas Sanchez, Tomas Cubelli; Leonardo Senatore, Juan Martin Fernandez Lobbe, Pablo Matera; Tomas Lavanini, Guido Petti; Nahuel Tetaz Chaparro, Agustin Creevy (capt), Marcos Ayerza. Replacements: Julian Montoya, Lucas Noguera, Ramino Herrera, Mariano Galarza, Juan Manuel Leguizamon, Martin Landajo, Jeronimo De La Fuente, Lucas Gonzalez Amorosino. To Wembley Stadium for the All Blacks versus Argentina. Beautiful weather in London, some atmosphere, with the Argentine faithful in good song. I am reliably informed that this could be the largest ever crowd for a Rugby World Cup match, eclipsing the 82,957 souls who saw England beat Australia in the 2003 final in Sydney. By contrast, Argentina, who have not beaten the All Blacks in 21 Tests, have seven World Cup debutants in their starting XV. Pumas head coach Daniel Hourcade has made five changes to the side beaten 26-12 by South Africa in Buenos Aires a month ago. Defending champions New Zealand will field the most experienced XV in international history against the Pumas. The All Blacks side features 1,013 Test caps in the starting line-up, with a further 316 on the bench. Eight of the New Zealand XV started that World Cup final four years ago, when the All Blacks beat France 8-7. Richie McCaw will lead his country for the 143rd time, with Tony Woodcock set to equal Englishman Jason Leonard's record of 104 Test starts as a prop. Today, reigning champions New Zealand begin their Rugby World Cup defence against Argentina in front of 80,000 people at Wembley. It promises to be a belter. We've had shocks, we've had dramatic finishes and we've had dominating wins. We've had brilliant individual performances from big names and lesser-known names alike. We've had an opening weekend full to the brim of fantastic rugby union action.